Another approach to addressing disparities involves targeting programs and outreach to minority populations. 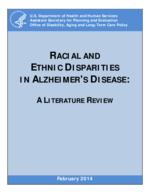 For example, the Alzheimer's Disease Demonstration Grants to States program provided demonstration grants to Florida, Kentucky, and the District of Columbia, that focused on African Americans (Wiener & Mitchell, 2007). For example, in the District of Columbia, the intervention focused on educational efforts conducted within church communities. They also held awareness events and developed caregiver respite programs. More recently, several of the current Alzheimer's Disease Supportive Services Program grantees, including South Carolina, California, Florida, North Carolina and Puerto Rico, are targeting ethnic or racial groups. Another intervention aimed at reaching minority populations is the Alzheimer's Disease Research Center Satellite Diagnostic and Treatment Clinics program (National Institute on Aging, 2010). Begun in 1990, the program established satellite clinics linked with one of the 30 existing Alzheimer's Disease Centers. In recent years, satellite clinics have been established on the Choctaw nation reservation, in Harlem, at Grady Hospital in Atlanta, and in St. Louis. The Alzheimer's Disease Centers are actively involved in formulating strategies and plans to recruit diverse populations to their clinics. Strategies that have met success include improved patient coordination, increasing the personal attention patients receive, home visits, and support groups (National Institute on Aging, 2010).